Savills Japan's spotlight report Beyond Tokyo 2020: Prospects for the Japanese real estate market indicates that nation-wide infrastructure improvement and redevelopment projects in preparation for the 2020 Olympics should have a positive influence on Tokyo's real estate market in the long term. Credit: Photo by Vincent Camacho on Unsplash licensed under . A series of nation-wide infrastructure improvement and large-scale redevelopment projects towards and beyond the 2020 Tokyo Olympics should have a positive influence on the real estate market in the long term according to Savills Japan. Macroeconomic and demographic trends are driving demand for real estate and encourage continuing development, especially in key cities. The Olympics could be a stage to showcase a new Japan and set the country on a resilient growth track. Upcoming 2020 Olympics has triggered a wave of redevelopment, transforming Tokyo and key regional cities. Massive redevelopment projects as well as infrastructure improvements towards and beyond 2020, will renew Tokyo's landscape and make the city more attractive and accessible. Macroeconomic and demographic trends should continue to support development after 2020 in key cities. The Olympics could highlight the beginning of new growth period for Japan's economy and real estate market. Several risk factors need to be carefully monitored, including rising protectionism, the planned consumption tax hike, and a possible loosening of cap rates. CLSA estimates annual gross gaming revenue of US$25 billion in Japan compared to Macau's 2017 result of US$33 billion. UNWTO forecasts visitation to Aisa Pacific region to grow 65% by 2030. The IMF projects real GDP growth of 1.2% in 2018 and 0.9% in 2019. Fees from overseas subsidiaries increased from JPY2.2 trillion in 2009 to JPY4.5 trillion in 2015. As of June 2017, Japan has over 2.4 million foreign residents, up 22% from 2012. 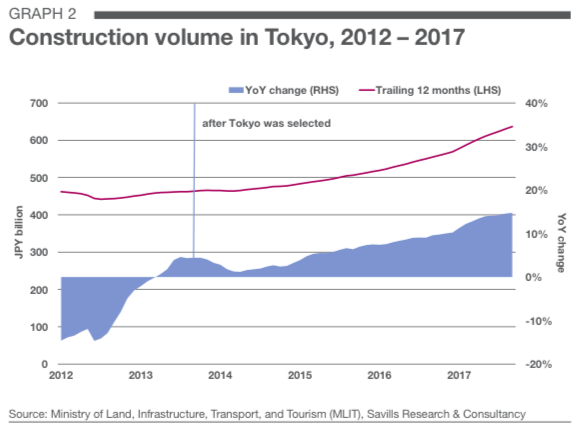 Construction volume in Tokyo skyrocketed in 2013 when the city was selected to host the 2020 Olympics. Most developments are aiming for completion in time for the event. Ongoing developments will have a long-term impact on Tokyo and ultimately improve its status as a global gateway city. Fukuoka's Tenjin Big Bang Project. Meitetsu - Nagoya Station redevelopment. Beyond Tokyo 2020 indicates that the Bay area has also experienced rapid increases in population following the development of residential towers. The Tokyo Metropolitan Government has designated the area as a strategic place for tourism, as well as meetings, incentives, conventions, and exhibitions (MICE). The Olympics will facilitate the area's growth as the Tokyo Big Sight significantly expands its capacity to accommodate the international broadcasting centre and main press centre. Nationally, the integrated resort (IR) developments should be a significant tailwind for expanding tourism. Under the assumption that two urban IRs and ten regional casinos would be built, CLSA has estimated potential annual gross gaming revenue of US$25 billion in Japan, comparable with US$33 billion in Macau for 2017. Considering the World Tourism Organization (UNWTO) forecasts that the Asia Pacific region’s international visitation will grow 65% by 2030 and IR developments are expected to take off. Positive macroeconomic conditions are fuelling development, and the momentum is likely to continue as the Japanese economy is on a steady growth track. In January, the International Monetary Fund (IMF) and the World Bank both made upward revisions to their GDP projections for Japan, encouraged by sound growth in 2017. The IMF projects real GDP growth of 1.2% in 2018 and 0.9% in 2019, and the World Bank’s figures are similar. According to Savills' report, the influence of macroeconomics on real estate can be clearly illustrated by comparing office market performance with corporate profitability trends. 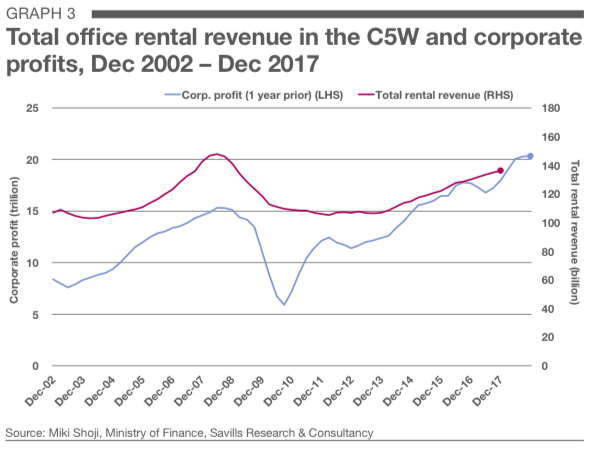 Historically, corporate profits have exhibited a strong correlation with overall office market performance in the central five wards (Graph 3). Corporate profits rapidly recovered after a sharp drop in 2009 and reached JPY22 trillion in 2017, a JPY7 trillion increase over the pre-recession peak. 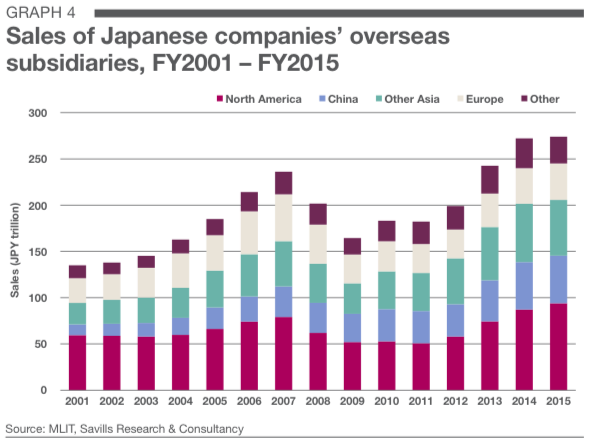 In addition to positive domestic economic growth, Japanese companies’ overseas expansion has also improved corporate performance. The sales of these offshore subsidiaries expanded from JPY165 trillion in FY2009 to JPY274 trillion in FY2015. During the same period, dividends and other fees from these overseas subsidiaries increased from JPY2.2 trillion to JPY4.5 trillion, thereby creating a large cash inflow to Japan. Demographic shifts are another major driver of the real estate market. In Tokyo’s 23 wards, annual population growth has been about 80,000 persons on average between 2000 and 2017. According to the Tokyo Metropolitan Government’s projection based on 2015 census figures, urbanisation is expected to maintain population growth until 2025 in Tokyo Prefecture and until 2035 in the central five wards. 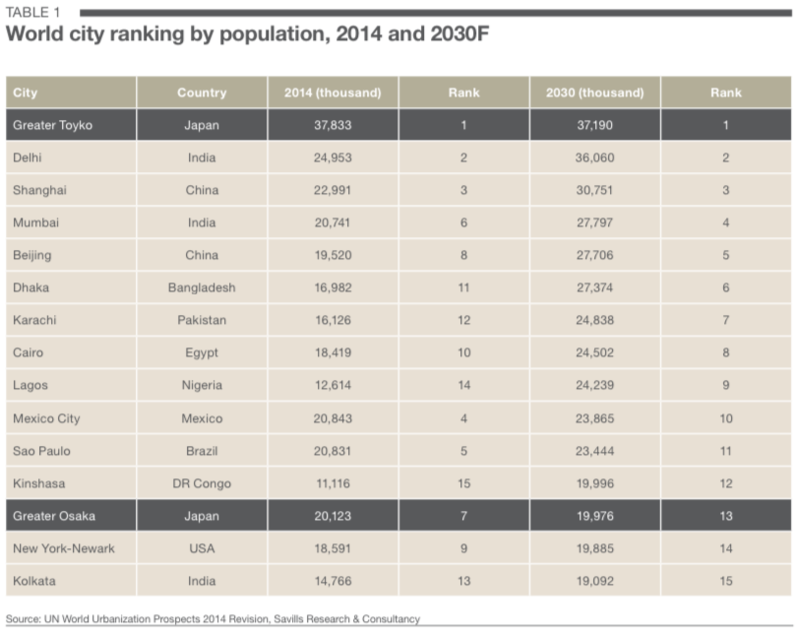 According to the United Nations World Urbanization Prospects, Greater Tokyo will remain the most populated metropolitan area in the world until at least 2030. With the construction boom preceding the Olympics, the report suggests a foreign workforce is also increasingly contributing to population and economic growth. As of June 2017, Japan has over 2.4 million foreign residents, up 22% from 2012. Over the same period, the size of the foreign workforce in the construction industry increased by 42,000, or 320%. Growing foreign population is an especially positive sign for regions where depopulation is an imminent issue. Combined with growing tourism in regional cities, an inflow of people may buoy economic conditions and trigger a positive development cycle. If the above trends continue to sustain economic strength and real estate demand, the property market is likely to remain on a sound growth track. Rising protectionism, geopolitical issues, interest rate hikes, and the consumption tax hike, are all risks that could cause global economic recoil. The impact on the real estate market could be substantial if a large influx of supply in the pipeline leads to a loosening of the market at the same time. If global economic conditions remain sound and capital continues to flow into Japan, cap rates could remain tight or exhibit slight compression. Click here to view Savills Beyond Tokyo 2020: Prospects for the Japanese real estate market 2018 report. For more information or to discuss the report email Tetsuya Kaneko of Savills Japan via the contact details listed below.